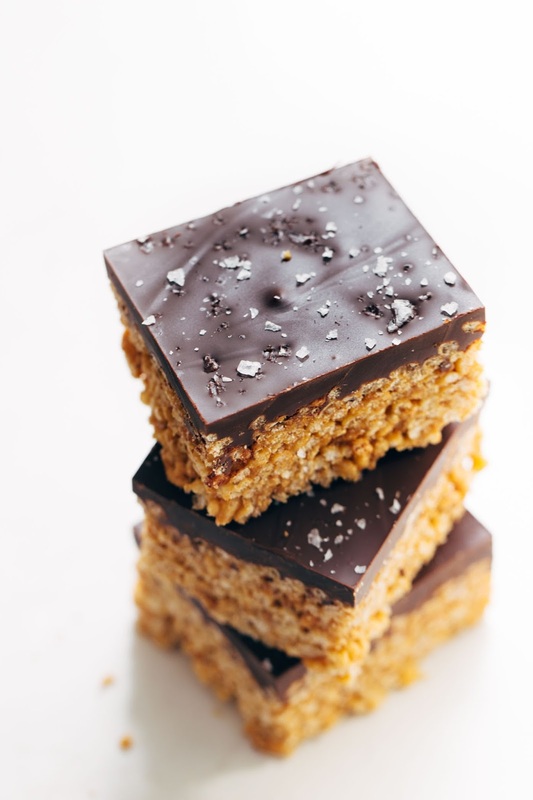 Sticky-sweet, lightly crispy peanut butter rice krispie mixture topped with a thick layer of melted chocolate and sprinkled with magical flakes of sea salt. That’s all, thank you and goodnight Twin Cities! Friends, this is the food I was raised on. In the background of every family and school event of my childhood lies a scratched and dented 9×13 of almost-gone scotcheroos. It is simple Midwestern goodness and it should not be messed with. Except, I did one thing: I messed with it. Whyyyy. As an anxious person finding her way through the world, I’d say I follow all rules of all places at all times exactly ALL THE TIME, but there is always that pesky 1% of the time at which point I become a rule-breaking, delinquent, rogue recipe “creative.” It is not wise to give me your classic recipes. I am not to be trusted with such precious, unbreakable things. I pinky promise I will take what is written and go off the rails with it. In my childhood, there was no swim meet, sleepover, or class party that did not require a pan of scotcheroos. And to this day, there is no weekend road trip or cabin visit that doesn’t require a pan of scotcheroos made by mom – but wait. I’m actually being 100% serious. My mom literally dropped off a little tupperware of scotcheroos just last week for our road trip up to the North Shore with Kev and Mel. Let me say that again: MY MOM DROPPED OFF TREATS FOR ME AND MY FRIENDS. Last week. I am 31 years old. Scotcheroos are the symbolic representation, the physical manifestation, of all that is good and right about treats made by mom. Can you guys confirm this? Midwesterners? Kids? Grown ups acting as kids? Moms? I’m very confident that this is just a fact of life when you are born and raised in small town Minnesota. So let’s get to business. What exactly makes a scotcheroo modern? We’re going clean and modern on a few different fronts here. Replacement of corn syrup + sugar with brown rice syrup + real maple syrup. Replacement of rice krispies with brown rice krispies. Replacement of butterscotch-chocolate topping with dark chocolate sea salt topping. Strict adherence to the shape, texture, and general basic awesomeness of the classic scotcheroo is of extreme importance. 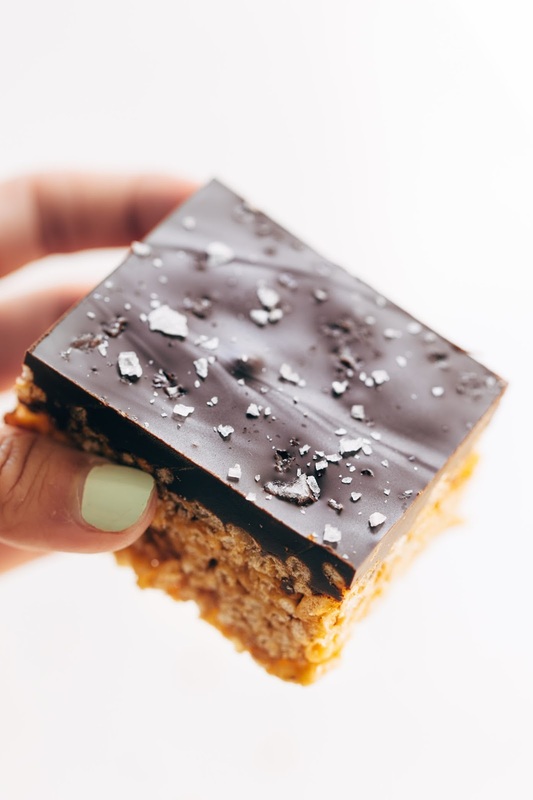 The goal here is to end up with a chewy, crispy, chocolate-top-heavy dessert bar that is an almost-mirror image of the original. Hear me out, please, all you treat-making moms across the great states of Minnesota and Wisconsin: the classic still reigns supreme. This is it no way meant to be a replacement for all that is good and right about retro Midwestern dessert bars. This is just a modernized version for the days when a) YOU NEED A SCOTCHEROO, and b) you’d like it to fall more under the homemade-granola-bar category as opposed to the just-ate-dessert-for-breakfast-again category, and c) you are a grown adult human person – possibly also modern – and you should be able to make your own dessert bars by now. Confession: Even though they are not the most high quality thing a person could ever eat, I cried a few tears when I left the butterscotch chips behind in this recipe. That being said, I cannot recommend the sea salt dark chocolate combo enough. If you felt strongly about this and wanted to leave the original topping alone (chocolate + butterscotch chips) so you get some butterscotchy vibes in your life, by all means. You do you, friend. 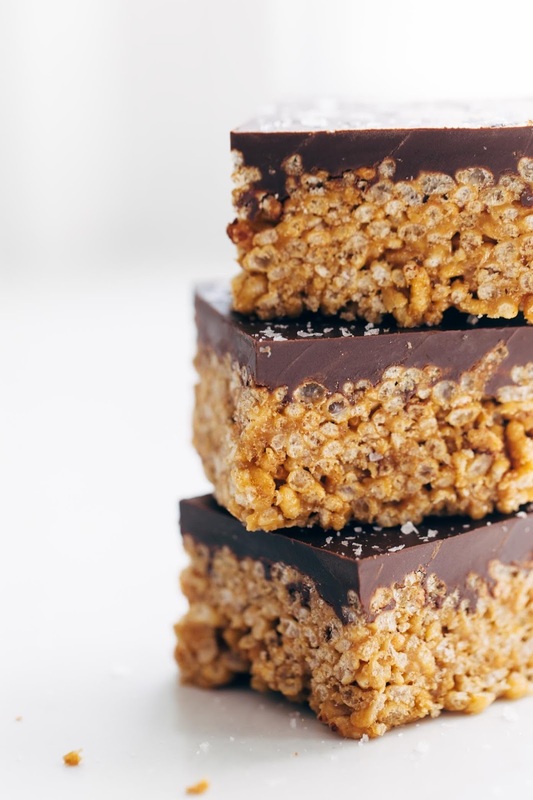 Dear Modern Scotcheroos: we’re grown ups who make our own chocolate peanut butter rice krispie bars now, and we’re coming for ya. 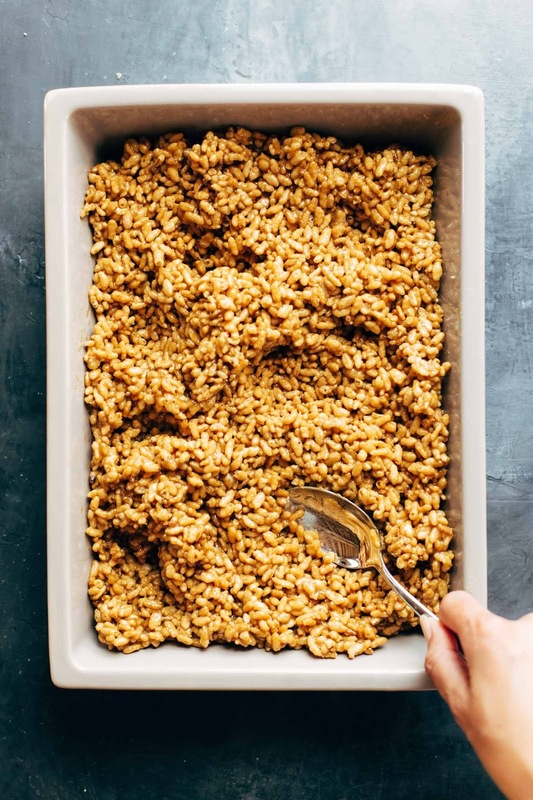 Rice Krispie Mixture: Melt brown rice syrup, peanut butter, and maple syrup in a large pot until a smooth mixture forms. Add a pinch of sea salt and stir in the brown rice krispies. Remove from heat and press into a 9×13 pan. Chocolate Topping: Melt chocolate chips gently and slowly (preferably in a double boiler, or, in my case, a random stainless steel bowl fitted inside a pot of simmering water, but microwave or regular saucepan works, too). 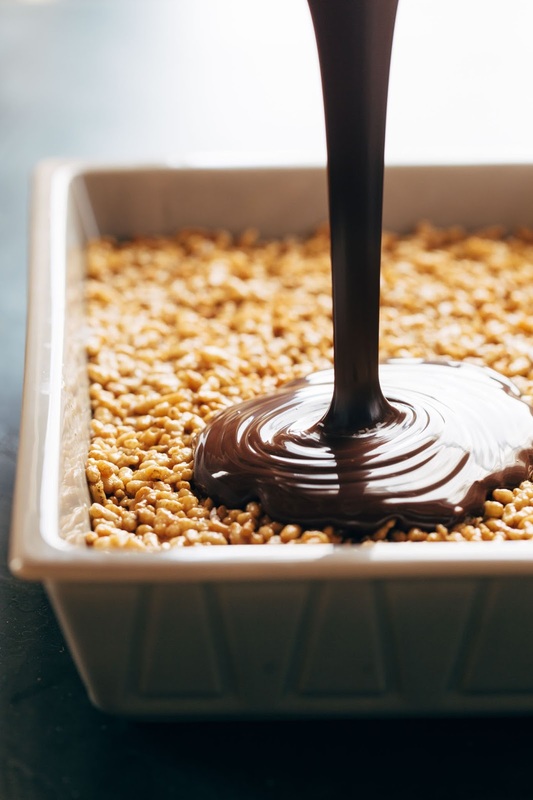 Pour chocolate over the rice krispie mixture and sprinkle again – !! – with sea salt because you don’t want to hate your life. Rest at room temperature until chocolate is set and watch them disappear. I usually get my brown rice krispies at Whole Foods (store brand), but you can also just use regular rice krispies if you can’t find the brown rice version. I tried subbing honey in place of the brown rice syrup and/or maple syrup and did not love it. It works texturally, but it is so overwhelmingly sweet. Like, make-your-teeth-hurt sweet. This coming from someone with a pretty high tolerance for sweets. I’d highly recommend sticking with the brown rice syrup which has a nice sticky texture but a much less dramatic sweetness to it. These travel so well! We take them everywhere with us in the summer – parties, road trips, etc. Lately my inspiration in the kitchen has been flowing freely and I am loving it. I am feeling inspired by so many great cookbooks, dishes listed on restaurant menus, and especially by beautiful offerings at my favorite local markets and stores. Sometimes a single ingredient sets my mind rambling until I settle on the perfect way to feature it. In the case of this particular recipe, I found these gorgeous vibrant locally grown edible flowers, and I knew I had to do something with them. I wanted something light, pretty, and subtly floral and thus, lemon lavender cupcakes were born. There are a few different approaches you can use to make the lavender sugar. The one I used and what I recommend is to finely grind culinary lavender buds in a spice grinder and combine a small amount with the sugar (recipe below). You can try grinding the buds with a mortar and pestle, but I have tried this before and find that lavender doesn’t grind finely enough. You could also use a food processor, but you would have to use quite a lot of lavender and you only need a teeny bit for this recipe. One additional approach would be to simply combine lavender buds with sugar and let the scent infuse the sugar over time. This would bring the flavor but would not have the lovely flecked appearance that I prefer. Tons of options – see what works best for you! Side note – the kids both thoroughly enjoyed helping me style the cupcakes themselves as well as these photos. I think they did a pretty good job! Preheat the oven to 350˚ F. Line cupcake pans with paper liners. In a medium bowl, combine the flour, baking powder and salt. Whisk to blend. In the bowl of an electric mixer, combine the sugar, lemon zest, and butter. Beat on medium-high speed until light and fluffy, about 3-4 minutes. Blend in the eggs and egg yolks one at a time, scraping down the sides of the bowl as needed. In a small bowl or measuring cup, blend together the sour cream, lemon extract, and vanilla. With the mixer on low speed, add the dry ingredients in three additions alternately with the sour cream, beginning and ending with the dry ingredients, and mixing each addition just until incorporated. Divide the batter evenly between the prepared liners. Bake until the cupcakes are just set and pale golden, about 20-22 minutes. Let cool in the pan about 5 minutes, then remove to a wire rack to cool completely. To make the frosting, place the butter in the bowl of an electric mixer fitted with the whisk attachment. Whip on medium-high speed until smooth, about 1 minute. Add the confectioners’ sugar and lemon zest to the bowl and mix on medium-low speed just until incorporated. Add in the salt. Continue to beat on medium-high speed until smooth, about 1-2 minutes. Mix in the heavy cream and lemon juice on low speed just until incorporated. Increase the mixer speed and whip on high speed until light and fluffy, scraping down the bowl as needed, about 4-5 minutes. Transfer the frosting to a pastry bag fitted with a wide plain round tip. Pipe a round dome of frosting onto each cupcake. In a small bowl or ramekin, combine the granulated sugar with the ground lavender and whisk until evenly combined. Gently dip the frosted portion of each cupcake into the sugar mixture to adhere a thin layer over the entire surface without distorting the shape. Once fully coated, you can gently cup the frosting with your hand to help mold it into an even mound. Garnish as desired with fresh lemon peel, lavender sprigs, or edible flowers. 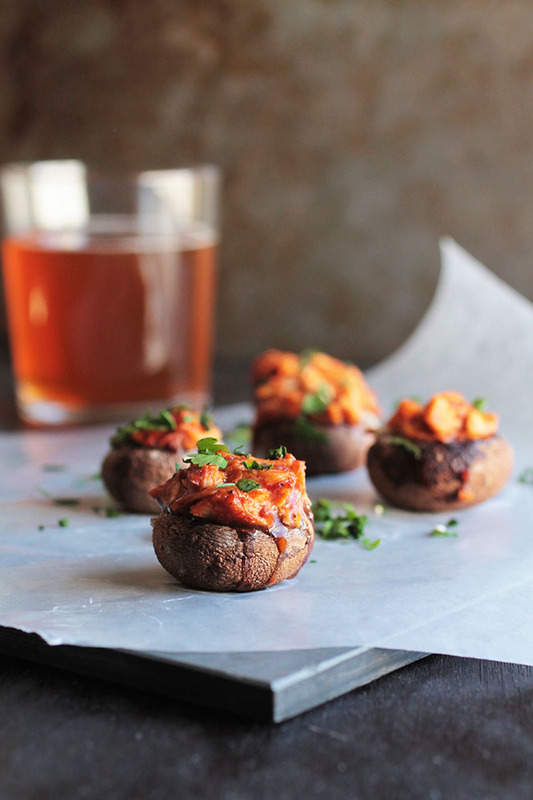 These fun and easy stuffed mushrooms are full of easy barbecue pulled chicken, spicy pepperjack cheese, and fresh cilantro. This post contains affiliate links, which means if you choose to purchase something I’ll earn a small commission at no cost to you. There are very few things in this world I love more than barbecue sauce. It’s just – ahhhh. So good. And a splash of BBQ can lend a quick smoky touch and immediate depth of flavor to even the easiest, simplest dishes. Also, I have a real problem with soggy mushrooms, so here’s a nifty trick to help you keep your stuffed mushrooms roasted to perfection: place a cooling rack on top of a rimmed baking sheet, then place your stuffed mushrooms on top of the rack before baking them. I use an oven safe cooling rack like this one from Amazon! The cooling rack keeps the mushroom caps elevated, which means they aren’t swimming around in whatever liquid they release as they cook. Just be careful moving the pan around – mushrooms like to roll around a bit on the cooling rack, so move slowly to avoid any flipped-over-stuffed-mushroom catastrophes. 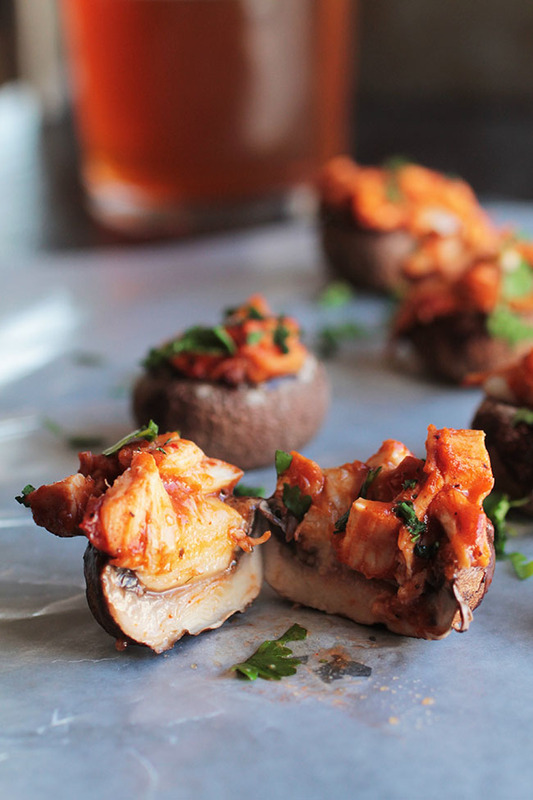 Basically, this combo (awesome, easy, delicious stuffed mushrooms + a kitchen hack to keep them from getting soggy) is a winner. And it will help you look like a total pro in the kitchen even if all you have to work with is half an hour and no patience for actually cooking things. Plus, umm, vegetables + protein = HEALTHY, right? Place a wire cooling rack on a baking sheet and place mushroom caps top-side down on top of the rack. Salt and pepper mushroom caps to taste. 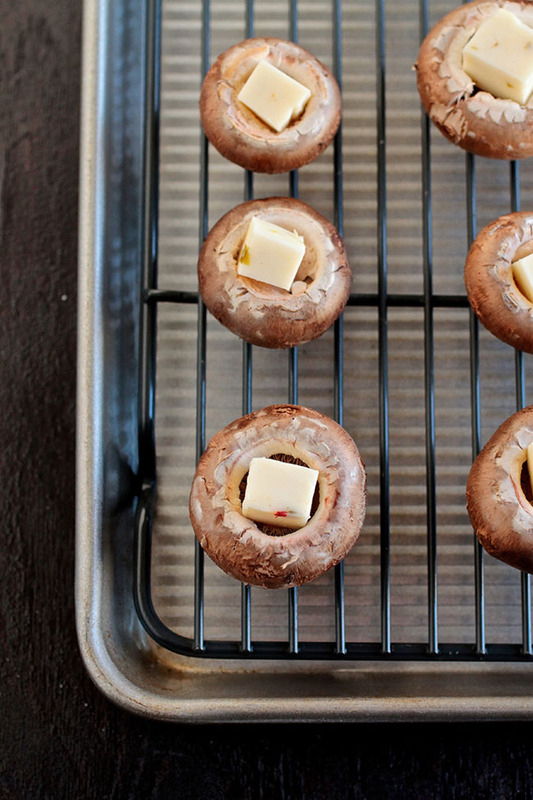 Place a cube of pepper jack cheese inside each mushroom cap. You may not use all of the cheese, and you may have to cut the cubes up a little smaller depending on the size of your mushroom caps. Just finagle it so that you have pepper jack cheese filling up as much of the mushroom cap as possible! In a small bowl, mix together shredded chicken and BBQ sauce. 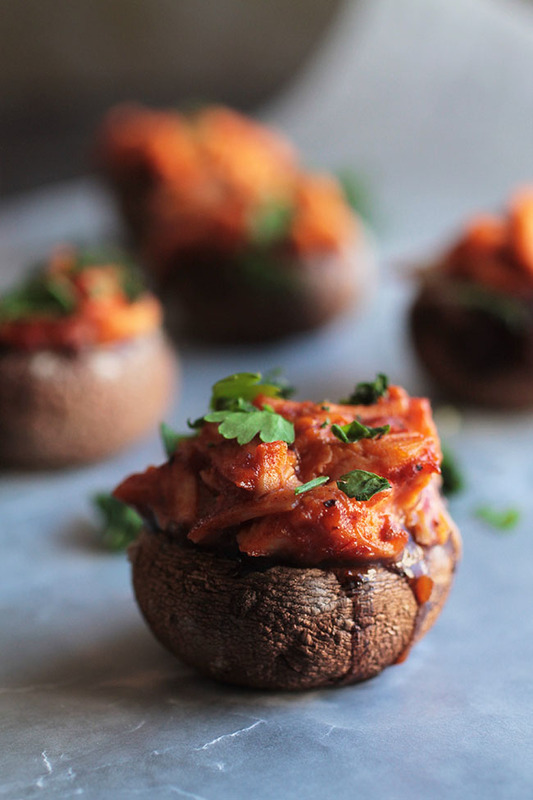 Top each mushroom cap with a spoonful of shredded BBQ chicken. Carefully place baking sheet with stuffed mushrooms into a 375 degree oven for 20-25 minutes until mushrooms are cooked through and cheese is melted. Remove mushrooms from baking sheet and top with fresh chopped cilantro. Serve immediately. You could also use shredded pepper jack cheese in place of the cubes – I found the cubes to be a little quicker and easier. Try to use a cooling rack that’s the same size as your baking sheet. I also recommend a rimmed baking sheet like this one (as opposed to a flat cookie sheet). Move slowly when you’re picking up the baking sheet – mushrooms can roll around on the rack if you’re not careful, so keep an eye on them to avoid any spills! 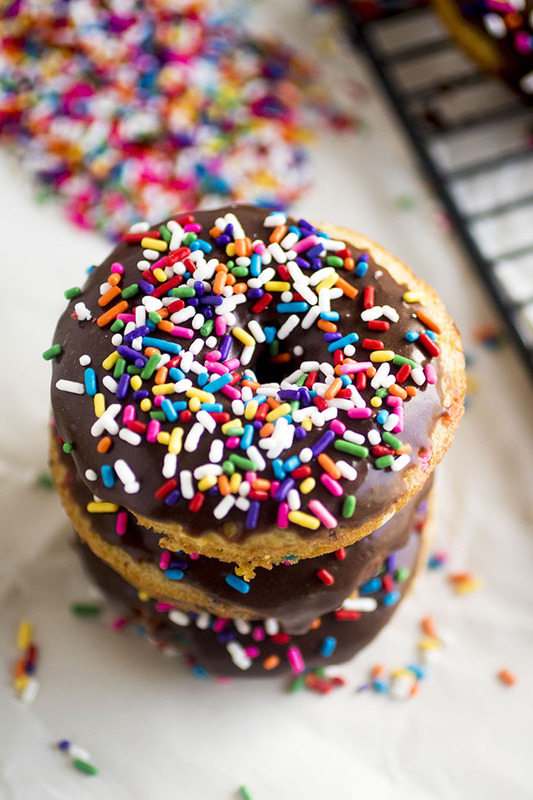 I’m extra excited about these donuts because APPARENTLYYYYYY today is National Donut Day! (At least according to the interwebs and my suddenly donut-covered Instagram feed. But whatever. I’m rolling with it). This is officially the first time in, umm, EVER that I have actually been “on time” for a food holiday. Usually I’d be like “OMG! Donut pictures! National donut day! How fun!” and then three weeks later I’d be like “here is a donut recipe because I am chronically late to all of the internet parties but you can totally bookmark it for next year! But not today, you guys. These donuts are pretty quick to make, and they’re baked (which means they’re basically health food, right?) 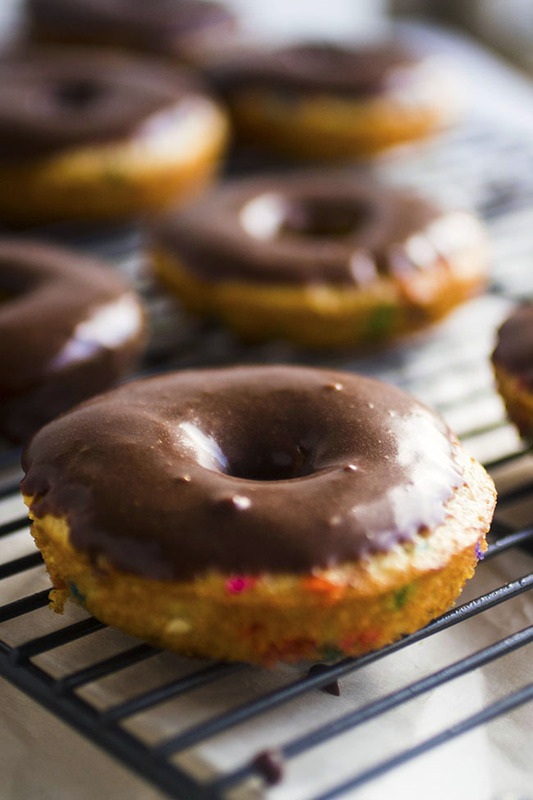 Dip ’em in the fudge-y chocolate glaze, hit them with all of the sprinkles, then let it set for a few minutes and you’ll be on your way to baked donuts bliss. In a large mixing bowl, stir together flour, sugar, baking powder, baking soda, salt, and nutmeg. Set aside. In a separate mixing bowl, whisk together milk, Greek yogurt, egg, melted butter, and vanilla extract. Add the wet ingredient mixture to the flour mixture and stir until batter is just combined. It should look like thick cake batter. 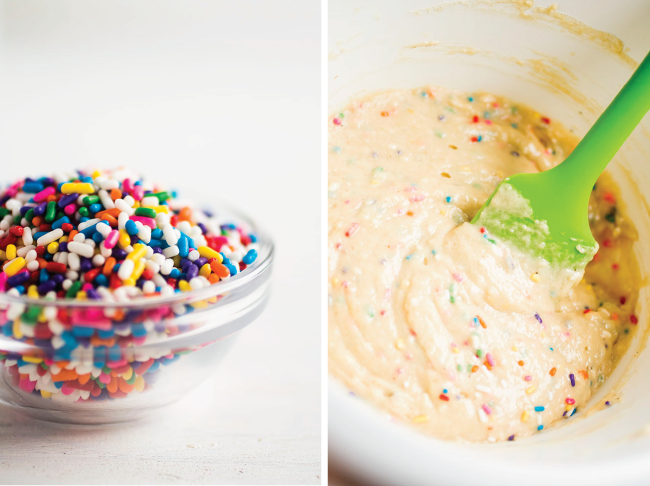 Gently fold the rainbow sprinkles into your batter. Spoon donut batter into a pastry bag with no piping tip (you could also use a plastic bag and snip off a corner with scissors). Pipe donut batter into donut pan, filling each cavity a little more than halfway full. Bake donuts at 350 degrees F for 10-12 minutes until lightly browned on top. Remove donuts from oven and let them cool in the pan for 5-6 minutes, then turn them out onto a wire rack to finish cooling. When donuts are nearly cooled, make the glaze. Whisk powdered sugar and cocoa powder together in a medium mixing bowl. Add melted butter and whisk it into the powdered sugar. Whisk vanilla extract and milk into powdered sugar mixture until smooth. The glaze should be thick and shiny. 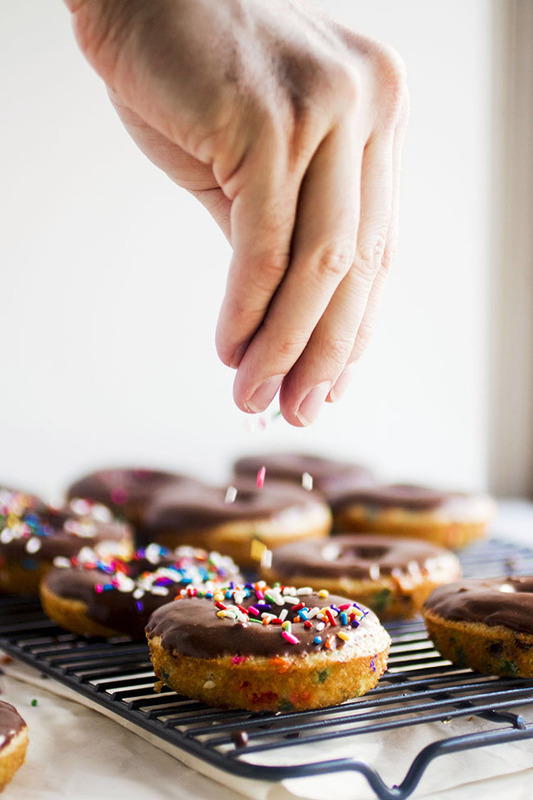 Dip the top of each donut into the glaze and return to the wire cooling rack (you may want to put a towel or plate under the wire rack to catch any drips of frosting). 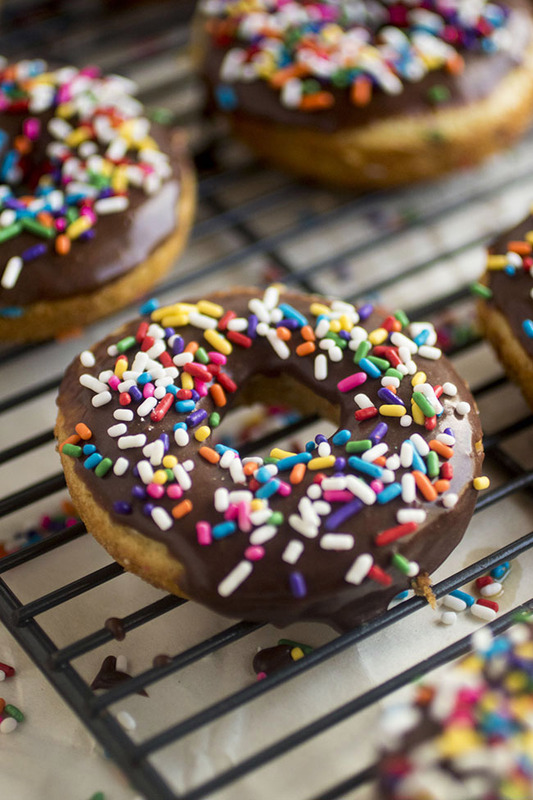 Top donuts with sprinkles while glaze is still wet. Let the glaze set for 10-15 minutes or so, then serve and enjoy. These donuts are best on the day they’re made, but you can store them in an airtight container on the counter for 1-2 more days if you don’t get through them all. Baked donuts can occasionally stick to the pan a little bit (I find it depends on the pan and the cooking spray you use) but just run a butter knife lightly around the edges of each donut to coax them out of the pan if they stick! Be sure to also let the donuts cool IN the pan for a few minutes before you turn them onto a cooling rack – I almost never tell you to cool stuff in the pan, but in this case it gives the donuts a chance to set and helps you pull them out of the pan a little easier! I use this donut pan (affiliate link) from Wilton. If you don’t have a donut pan, you can bake the batter in a cupcake or muffin tin, but you may need to adjust the cooking times, so keep an eye on them as they bake. 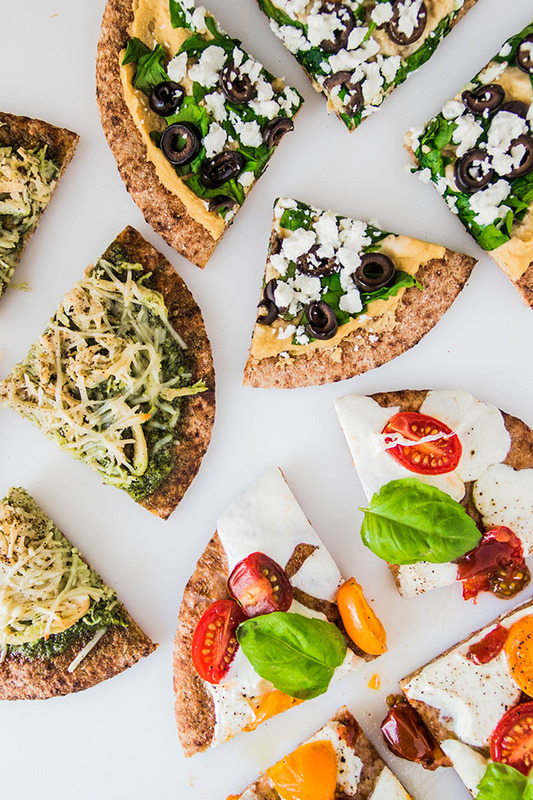 This quick and easy pita bread pizza collection is perfect for busy evenings and is great for meal prep! 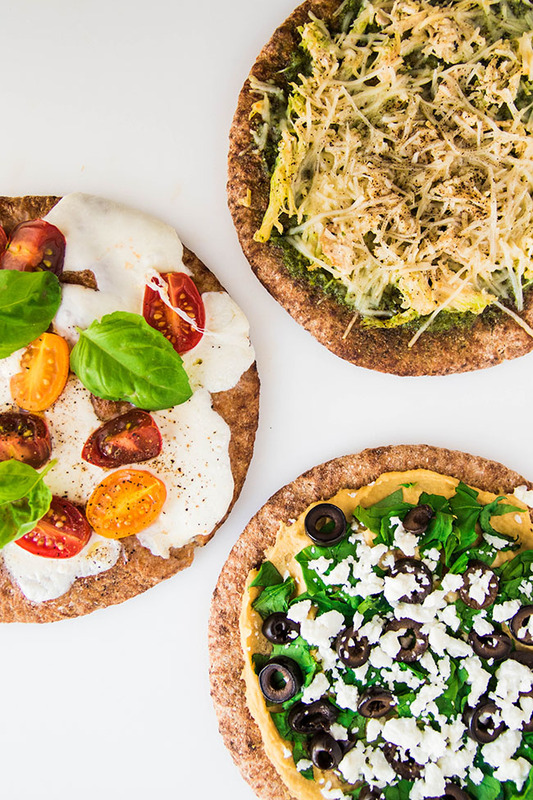 Three different pita bread pizza recipes, including two vegetarian options. A great addition to your meal planning rotation! You make my heart so warm and fuzzy. I am so blown away by the responses I received after Tuesday’s post. You’ve reaffirmed what deep down, I already knew: That this is a community of amazing people who care deeply, love fiercely, and will stand for no BS. I am so freaking proud of you and the work you’re already doing to make the world a little bit better. Thank you to the moon and back for sharing your stories with me over the past few days. I love you – madly and truly – and I am so hashtag blessed to know you, whether we’re standing together at a protest or simultaneously drooling over pizza from opposite sides of the country. But this IS pizza-LIKE. So I think it counts. Also, it involves whole wheat pita bread. And ALL OF THE TOPPINGS. And is ready in less than 20 minutes so you can get back to calling your senators and doing your taxes and then getting a little wine drunk while you watch the new Beauty and the Beast trailer 1095019858 times because you’re sick of acting like a grownup. …Not that I do that. I’m putting three whole recipes in this post, which sounds a lot more impressive than it is because really, this is not a very recipe-y recipe. Basically, the instructions are this: Put some stuff on a pita pocket. Cover it with cheese. Bake until cheese melts. Do a happy dance. The end. BUT BUT BUT: The combinations of these particular quick and easy pita bread pizzas are pretty much wonderful. There’s a quick margarita pizza (because cheese + basil + tomatoes = everything), a pesto + chicken + parmesan number (yay) and a Greek-inspired pizza that I totally and 100% ripped off from my friend Elizabeth, after she made us something similar a few months ago. This is the perfect “we-have-nothing-for-dinner” dinner, and it’s easy to make a few different varieties so that everyone gets a couple of unique slices. …or, y’know, so that you have five different mini pizzas all to yourself. You do you. Heat the oven to 375 degrees F.
Lay pita bread rounds in a single layer on a large baking sheet. They won’t rise or expand, so you can place them quite close together on the baking sheet if you need to. Choose your pizza! You can make all three of the combinations above, or just choose one or two, or add your own favorite pizza toppings! This is kind of a no-recipe recipe, so there aren’t too many instructions. Top each pita bread round with your desired toppings. 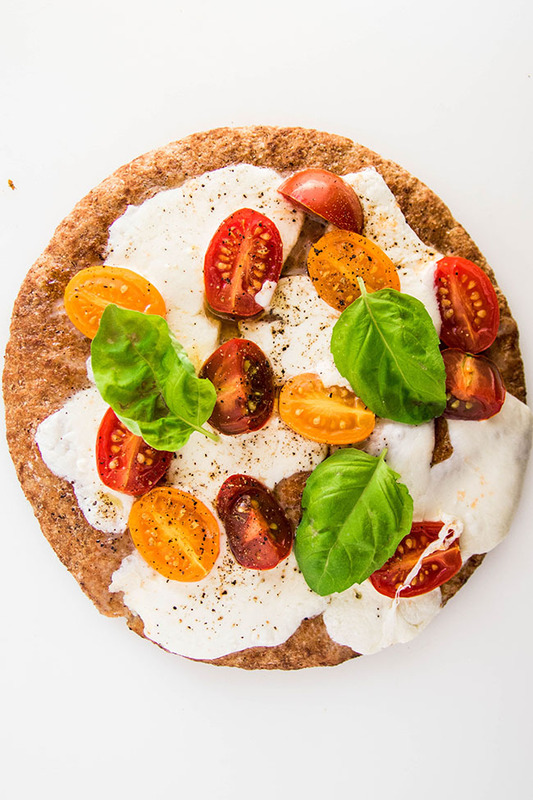 If you’re making the margarita pita bread pizza, leave the basil leaves off until AFTER the pizza is baked, and then add them at the last minute so they don’t wilt! 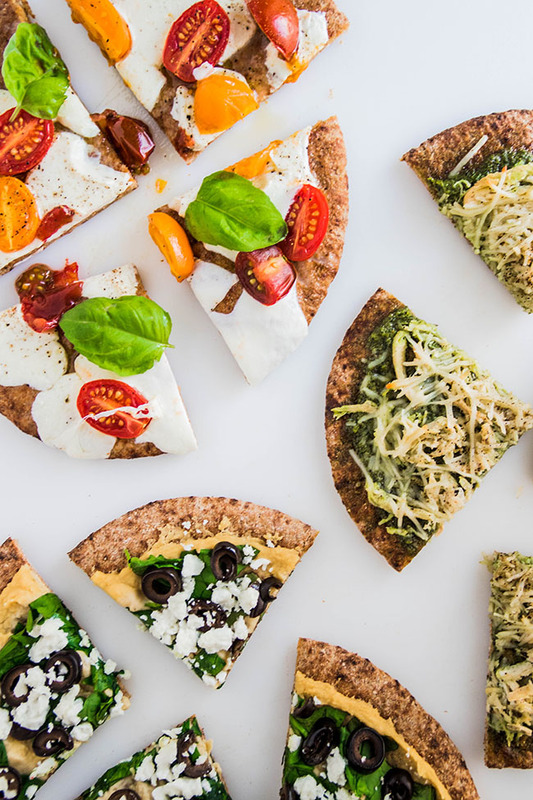 Bake pita bread pizzas at 375 degrees F for 10-15 minutes until pita bread has lightly crisped, toppings are heated through, and cheese has just melted. Slice pitas into quarters and serve immediately. 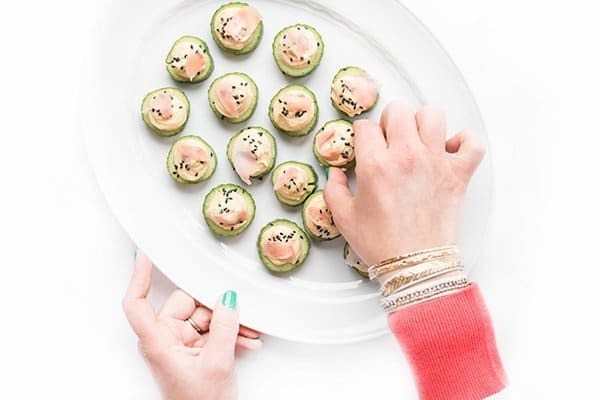 These sushi-inspired Cucumber Hummus Bites are scented with toasted sesame oil then topped with pickled ginger and roasted sesame seeds. The ultimate healthy snack recipe! 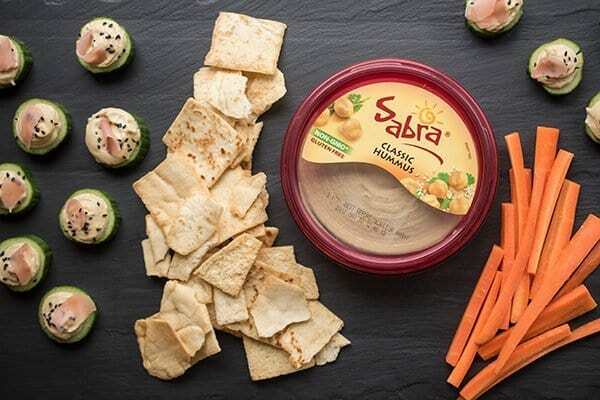 Two ingredients I always have in my refrigerator are Sabra hummus and English cucumbers. My boys will eat hummus with anything from a spoon to apple slices and the same goes for cucumbers. In fact, we frequently whip up a quick batch of my Japanese Quick Pickled Cucumbers to snack on while I’m cooking dinner. Whether or not you have little ones at home, I think we can all agree: snacks are life. 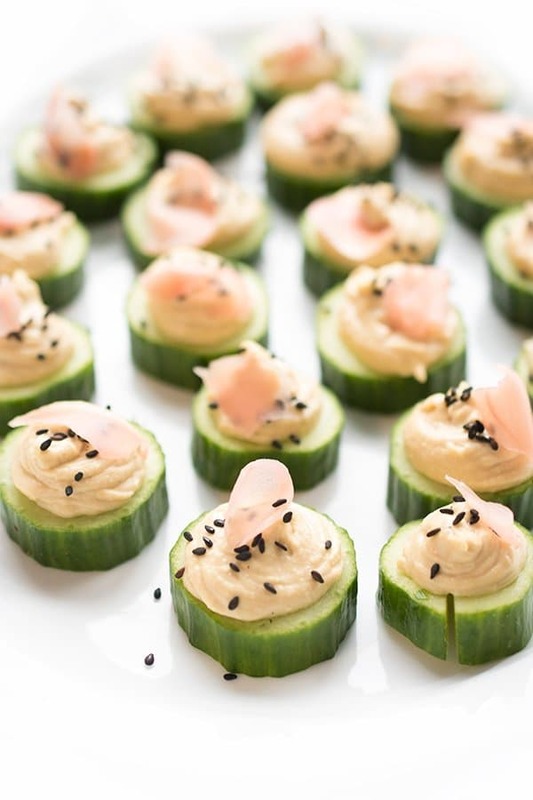 When my friends at Sabra asked me to create a healthy snack recipe, I decided to create a sushi-inspired Hummus Cucumber Bite with Pickled Ginger. 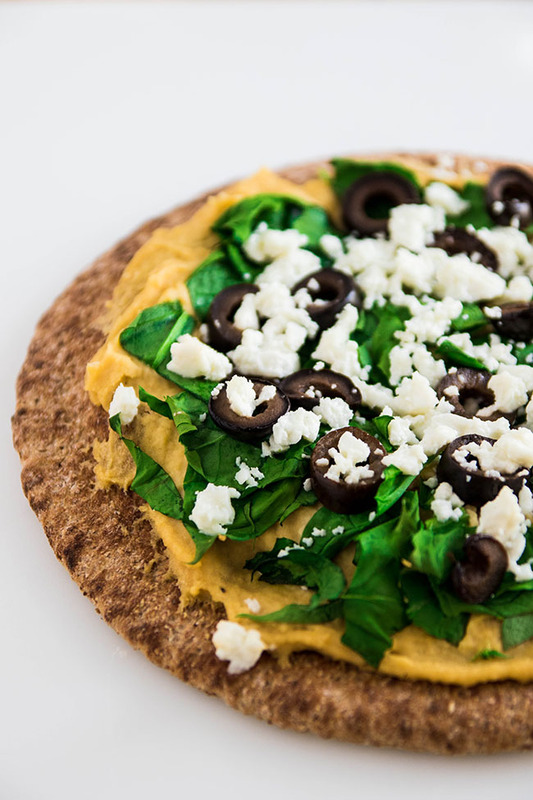 Made with just 5 simple ingredients, this healthy snack recipe takes just minutes to make. Hummus is mixed together in a bowl with soy sauce and sesame oil before before piped onto cucumber slices using a simple plastic bag. For crunch and tanginess, I top each piece with pickled ginger and black roasted sesame seeds. Scallions would be great sprinkled on top as well. While we typically eat these as a snack either after the gym or after school, they are beautiful and tasty enough to serve at a party. 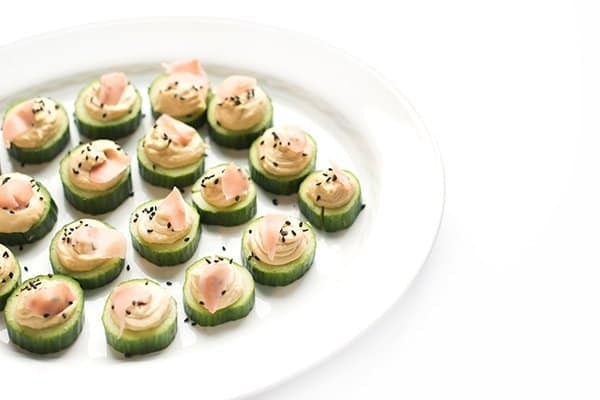 Place cucumber slices on a large platter and set aside. In a medium bowl, whisk together hummus, soy sauce and sesame oil. Carefully scrape entire mixture into a pastry bag or a resealable plastic bag. If using a plastic bag, cut off a small tip at one corner for piping. Working one piece at a time, pipe about 1 tablespoon of the hummus mixture on to each cucumber piece. Top each with a piece of pickled ginger and sprinkle with black roasted sesame seeds to serve. 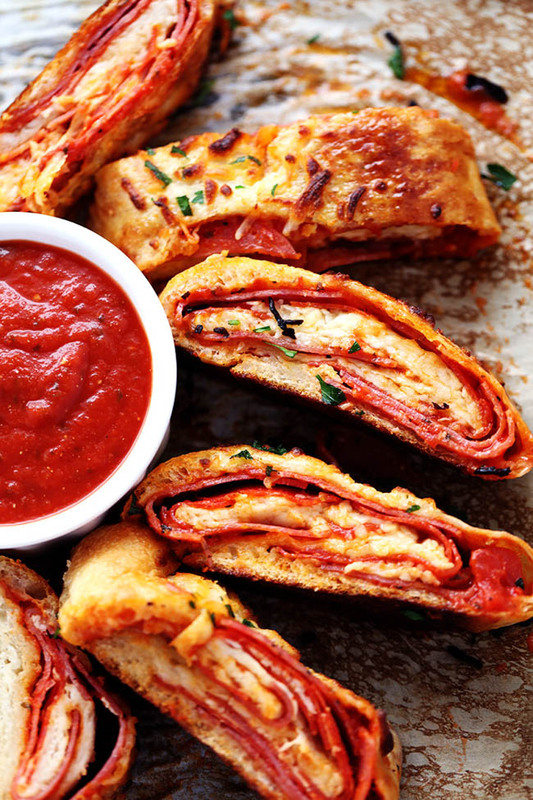 Quick and Easy Stromboli gets loaded with italian salami, pepperoni, pizza sauce and cheese! This is so quick, easy and delicious you will want to make it again and again!! Do you ever make something and wonder why you haven’t made it before? This my friends is “that recipe”. Holy cow. We have been missing out!! This recipe couldn’t be easier to make. It comes together in about 10 minutes and only takes 15 minutes to bake! You can always customize the ingredients to your families tastes. But the italian salami, pepperoni and cheese combo was delicious! I seriously can’t even believe that I haven’t made this until now! 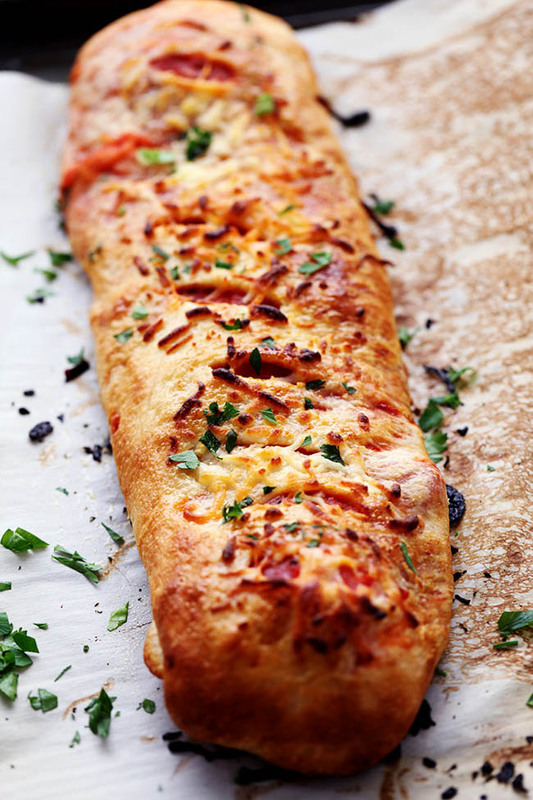 To save on time you use a refrigerated pizza crust and it comes together in less than 10 minutes. Since things have been so busy around here lately you better believe that this recipe will be happening on a weekly basis! You guys are going to love it too! You won’t be able to get enough of it! Preheat oven to 400 degrees. Roll the dough out and stretch it out on a piece of parchment paper. Spread the pizza sauce leaving about 2 inches from the edge. Top with italian salami, pepperoni, and 1 cup cheese. Roll up the dough up like a cinnamon roll and pinch the edges to seal and fold where the seam is. Lay the stromboli seam side down. Brush with the egg and cut small slats in the top. Top with ¼ cup cheese and sprinkle with fresh parsley. Bake for 15-20 minutes or until golden brown on top. 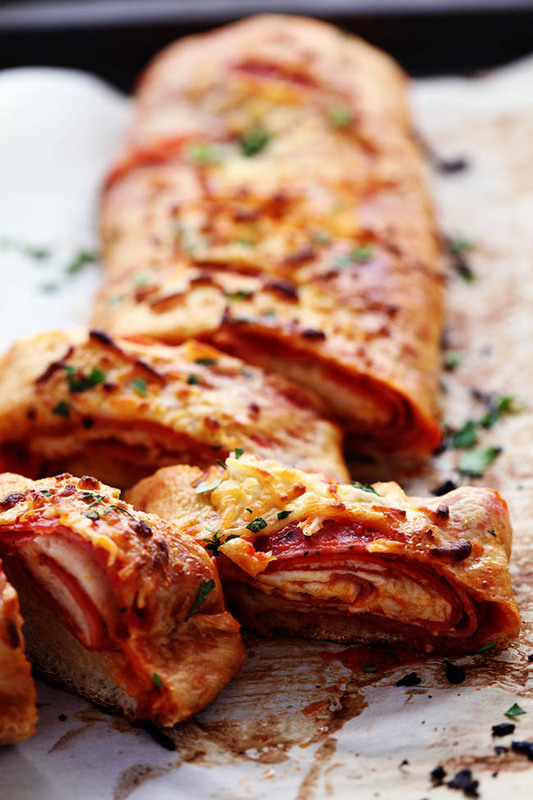 Serve with warm pizza sauce. You can always customize the ingredients to your families taste! These Billionaire Bars are made with 5 glorious layers of RICH and DECADENT sugary favorites! Shortbread, brownie, caramel, chocolate, and peanut butter frosting combine for the ultimate dessert bar! Everyone will be begging you for the recipe! These Billionaire Bars need to happen ASAP! Like legit, you need to go make them right now, they are THAT good! A large client project that wasn’t blog related. Family time – I hadn’t seen my inlaws since New Year’s Day and I hadn’t seen my mother in over a month. Morning Star was released, and yes, Matt and I already finished it! I’m trying not to work 14 hour days anymore. I’ve been in a bit of a funk. PIN IT TO YOUR RECIPES BOARD ON PINTEREST! FOLLOW COOK'S NETWORK ON PINTEREST FOR MORE GREAT RECIPES! In order to get myself out of my funk, I’m doing two things. I’m taking an impromptu trip to Puerto Rico next week with my friend, Rachael – airfare is soooo cheap out of Boston right now! And I’m kicking off a new series here on the blog! You guys know I love my Food & Fiction posts where I develop recipes inspired by my favorite books, shows, and movies. But for the next two weeks, I’m taking things one step further! The Oscars are on February 28th, and you might remember just how much I love film and that the Oscars are pretty much mine and Matt’s Super Bowl! 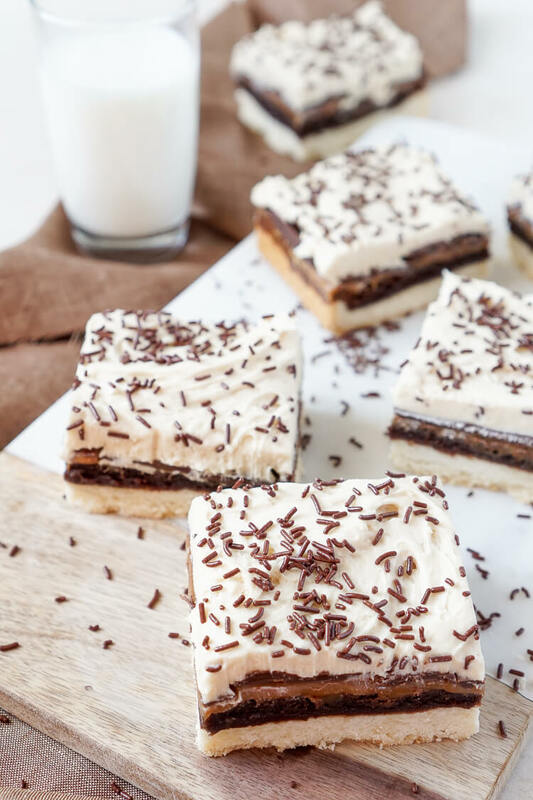 So between now and the ceremony, I’m going to bring you 8 glorious recipes inspired by the Best Picture nominations, starting with these Billionaire Bars inspired by The Big Short! We saw The Big Short last month, it’s about a handful of men in the world of high-finance that predict the credit and housing bubble collapse of the mid-2000s, and decide to take on the big banks for their greed and lack of foresight. With a star-studded cast, some great cinematography, and a decent screenplay – this movie about an insanely boring (and slightly sore) subject was actually pretty entertaining. The best way for me to describe this film is that it was kind of a breath of fresh air. The feature film/documentary approach gave it a unique cinematic mix that was both enlightening and fun. I can see why it’s getting Oscar buzz, but don’t think it will win. But back to these bars! 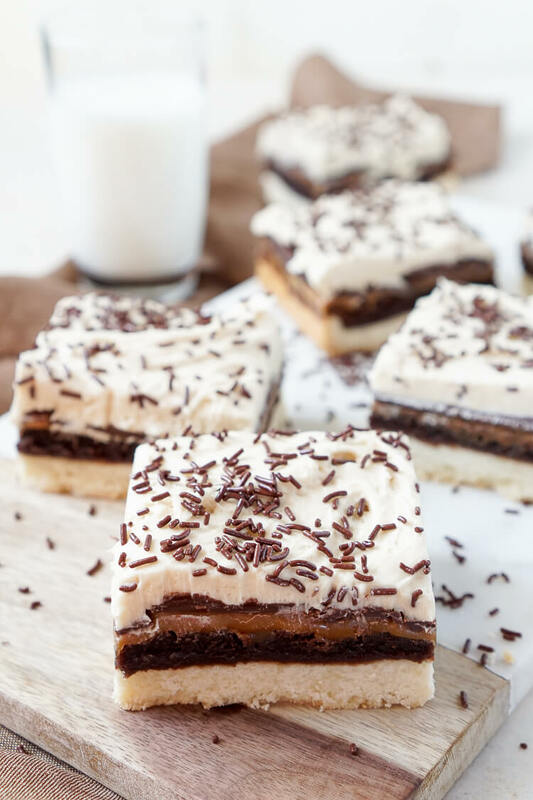 Most everyone has heard of Millionaire or Million Dollar Bars, they’re basically a homemade Twix with layers of shortbread cookie, caramel, and chocolate. 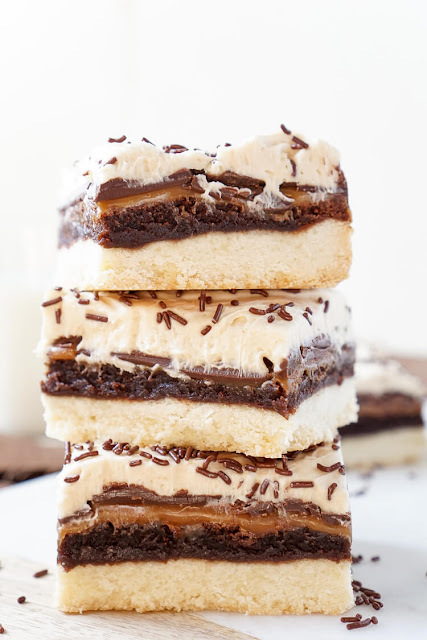 I’ve decided to crank that up a notch and add in two extra layers to make these Billionaire Bars! A layer of brownie and a layer of peanut butter frosting make these the most heavenly thing to come out of my kitchen since The Croissookie! Matt and I joked that the Billionaire title really comes from the fact that there’s probably about a billion calories in one pan of these babies, and though it’s not that extreme, there is a whole pound of butter in them! But they’re worth EVERY calorie! Line a 9 x 13-inch baking dish with aluminum foil and set aside. In a stand mixer fitted with a paddle attachment, cream together the butter and sugar, add in remaining ingredients and beating slowly at first then increasing to medium-high speed for 3 to 4 minutes until dough pulls away from the sides of the mixing bowl and is no longer crumbly. Press dough evenly into the prepared baking dish and set aside. Mix brownie ingredients together according to package instructions and pour over the shortbread dough, spreading out evenly. Bake for 30 to 35 minutes. When the cookie/brownie is about 10 minutes from being done, add the caramels and the heavy cream to a small saucepan and melt over medium heat, stirring constantly until candies are completely melted. Remove the cookie/brownie from the oven when ready and pour the caramel sauce evenly over the brownie layer. Chill in the fridge for 1 to 2 hours until caramel is stiff to the touch. 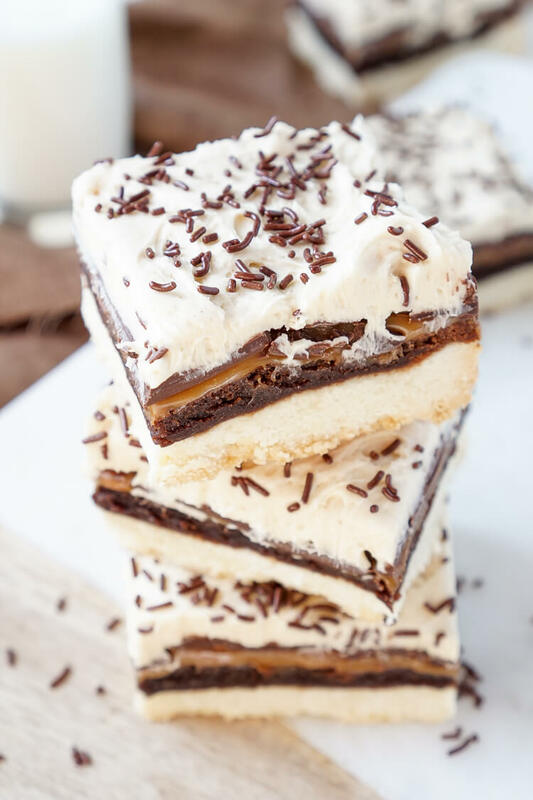 Once caramel layer has set, add chocolate chips and butter to a microwave-safe bowl and microwave for 30-second intervals until melted, stirring between each one. It usually takes 1 minute. Quickly pour over the caramel and use the back of a spoon to spread out in an even layer. Because the caramel is cold the chocolate will stiffen fast, so your need to work fast here. Make a half batch of my Best Peanut Butter Buttercream and evenly spread it out over the top of the hardened chocolate layer. Sprinkle with chocolate sprinkles. Gently lift the bars out of the pan by gripping the aluminum foil, I recommend picking one side of the bars to lift up while sliding the baking dish in the opposite direction so your bars are always close to the counter. Use a sharp knife to cut into squares for serving. A stand mixer with a paddle attachment is necessary for the shortbread dough or it may never come together.